I have heard a lot about the health benefits of millets before, but only recently we have started including Thinai (Foxtail millet) in our diet. At first, I got Thinai Arisi / foxtail millet rice in a exhibition stall. I asked the person in the stall if there are any special instructions for cooking this millet, he said you can cook it just as you cook normal rice. I made Ven Pongal with it and it came out very well. Since then I have made this Pongal almost 4-5 times. As I was away from blogging then, it didn't make it to the blog. When I recently made this for Krishna Jayanthi to offer to God, I clicked few pictures to post it here. 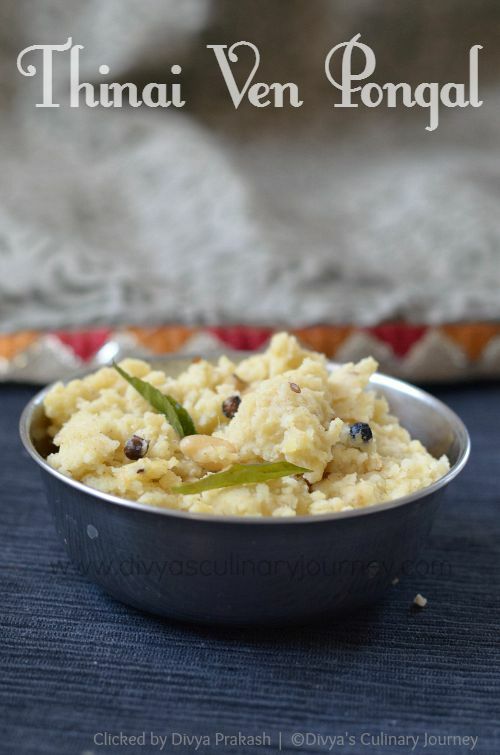 I have made this Venpongal as a vegan version without adding ghee. It is healthy and delicious as there is moong dal along with foxtail millet and is flavored with cumin, pepper and a hint of ginger. 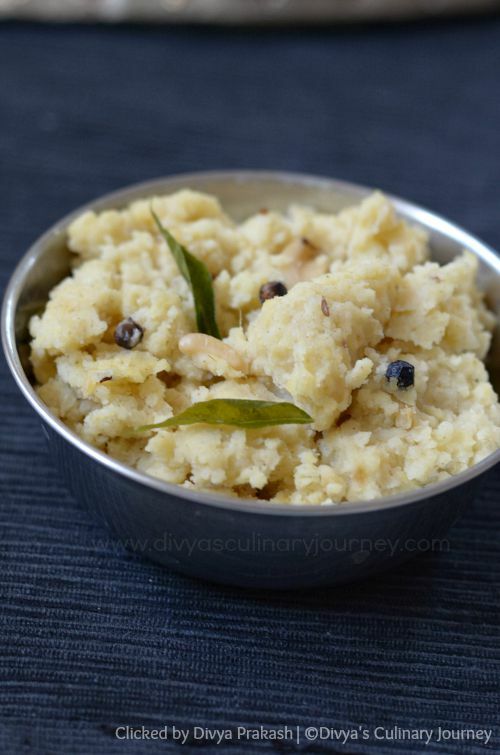 How to make Thinai Ven Pongal? Slightly roast moong dal in low flame till slight aroma comes. Keep it aside. Wash Thinai rice and keep it ready. Heat oil in a pressure cooker, add cumin seeds and whole peppercorns and fry for a minute, then add grated ginger, curry leaves & asafoetida and fry for another minute. Now add about 3 1/2 cup of water and bring it to boil. To the boiling water, add moong dal and thinai arisi along with required salt and mix well. Bring the heat down to medium and pressure cook it. Wait for a whistle, then bring the heat to low and cook for 5 minutes and turn off the heat. Wait till the pressure releases, then mix well and serve. I have added whole peppercorns. But If you do not like to bite it whole, you can crush them and add. Since I have made vegan version, I fried the cashews in oil instead of ghee and added them for garnishing. You can add them along with curry leaves itself in step 2. If you are not keen on the vegan version, then you can fry them in 1 tablespoon of ghee and add them in the end along with ghee and mix well. 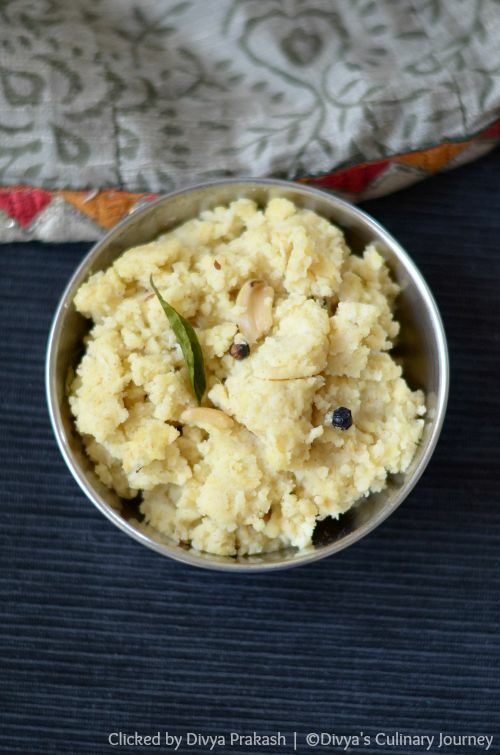 The aroma of ghee will make this thinai pongal extra special. I have used millet flour in my gluten free baking, but I haven't ever cooked with whole millet. This recipe looks wonderful for millet. Your Thinai Ven Pongal Recipe is super intriguing to me, I don't think I have ever had this recipe before and would to try it out. I might have to do so very soon.